So this is Cocovan, or simply Coco, as she introduced herself. I first saw her when I was walking through Washington Square Park the other day and she was kneeling an arranging her scroll-like letter on the ground, and then sat at the heart-shaped chair and desk at the head of it. I was mesmerized in a way and had to see what was up. "It's a love letter to the world from the world," she said with a smile when I questioned her. She is originally from Paris and has taken the letter across Europe thus far and plans on taking it to all seven continents, collecting signatures and letters of love and drawings along the way. Beautiful, I thought to myself before signing it. 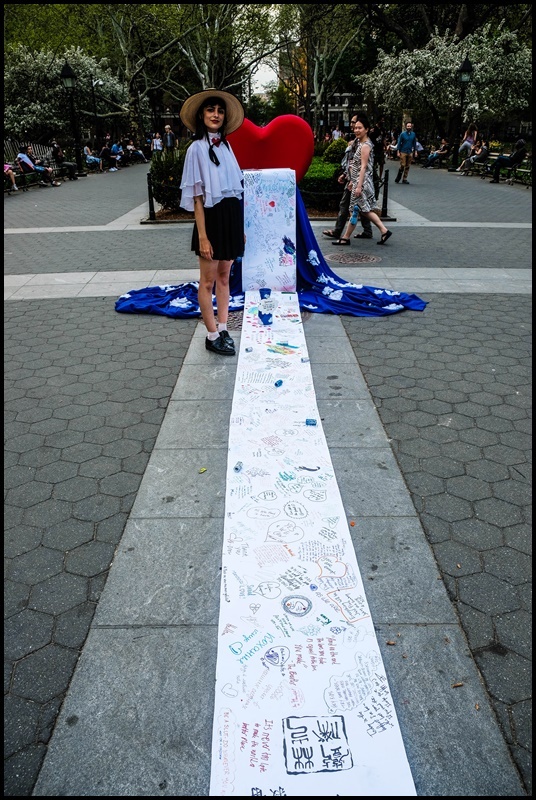 It is interesting to think that my short letter to the world is on this scroll along with thousands others and will travel the globe. Safe travels Cocovan, and thank you for spreading love. To read more about the project and the artist, visit Cocovan's website here.